The Byculla Club opened in 1833 as the first of Bombay’s residential clubs serving the British residents of the prosperous and elegant suburb of Byculla. It was later overtaken in popularity by the Yacht Club at Apollo Bunder, founded in 1898. 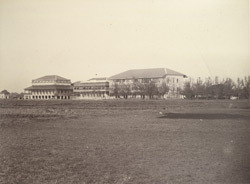 During the First World War, the building was turned into a hospital and was eventually sold in the 1920s.